The terminology associated with a twin pregnancy can be confusing and overwhelming. Finding out that you’re having twins is just the beginning of an exciting experience; along with adjusting to the idea of having two babies at once, there is a lot to learn! Here's a guide to understanding these terms, and what they mean for the developing fetuses. During a twin pregnancy, you may have heard the terms “Di/Di” or “Mo/Di” used to describe twins. These terms are used to classify and explain twin anatomy in the womb. Although it may sound like a lot of medical gobbledy-gook, they're important concepts for parents because some twins are at risk for complications. These terms describe twins — always monozygotic twins — that share an environment. They are enclosed in ONE amniotic sac and/or ONE chorion. 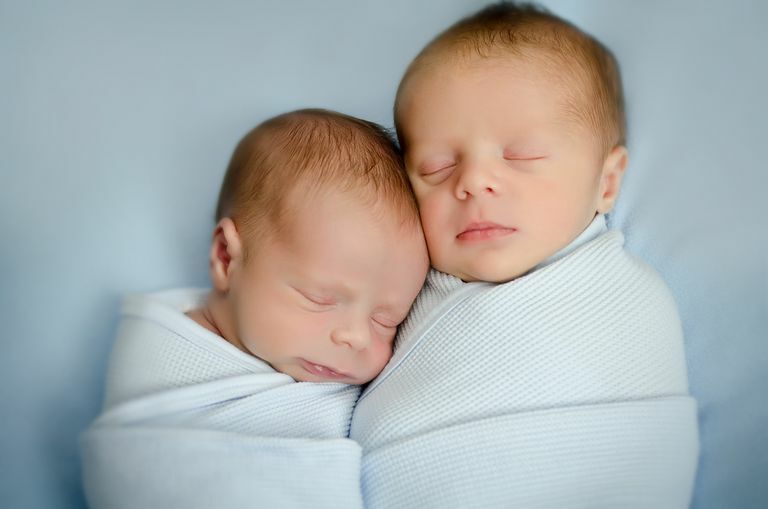 These terms describe twins — which can be monozygotic or dizygotic — that each has their own, separate sacs. There are two placentas, although in some cases, the placentas fuse together into one. So let’s look at them in combination. The majority of twins are di/di, that is, dichorionic, diamniotic. That means that they developed separately, each with their own placenta and own sacs. This is how all dizygotic — or fraternal — twins develop. In addition, some monozygotic (identical) twins will also form this way, depending on how early after conception the egg splits. However, some monozygotic twins will be mo/di or mo/mo. That means they are monochorionic but diamniotic, or they are monochorionic and monoamniotic. Twins cannot be di/mo. If there are two chorions, then they can not be in the same amniotic sac since it is the innermost membrane and, by definition, they will be separated. Di/Di twins are like two houses in the same neighborhood. Each baby lives in his own house and manages his own resources. Mo/Di twins are like two apartments in the same building. Each baby lives in the same building, but they have their own private space. They are separated by interior walls and doors, but the exterior of the building is shared. Mo/Mo twins are like two individuals living in the same room in the same house or apartment. They share the resources that come into the space within the same walls. How Is Twin Chorionicity Identified? During pregnancy, an examination of the placenta(s) and membranes via ultrasound can sometimes confirm chorionicity. An ultrasound scan, usually early in the pregnancy, will check for one or two placentas and the thickness of membranes. A thicker membrane can indicate di/di twins, while a thin membrane or the absence of a membrane can signal mo/di or mo/mo twins. Sonographers can also check for the “twin peak sign” — also called the “lambda sign” because of its resemblance to the Greek letter: λ. It forms where the two placentas and sacs abut in di/di twins. A T-shaped structure can indicate mo/di twins. The only definitive confirmation of di/di twins during pregnancy is when the babies are identified as one boy and one girl. If they are different sexes, they are dizygotic. (With rare exception.) Remember, all dizygotic twins are di/di, while monozygotic twins can be di/di, mo/di or mo/mo. After delivery, a pathological analysis of the placenta and membranes can give some insight, but it’s most important to determine chorionicity during pregnancy in order to monitor and address any potential complications. Knowing the chorionicity of twins can help assess risk and determine a treatment plan to provide proper prenatal care for an optimal outcome of the twin pregnancy. Dichorionic/diamniotic (di/di) twins generally present fewer additional risks. However, mo/di and mo/mo twins should be monitored carefully because they are at increased risk for complications. Twin-to-Twin Transfusion Syndrome (TTTS) or Twin Anemia-Polycythemia Sequence (TAPS) can develop in mo/di twins. Mo/mo twins can be compromised by cord entanglement. Fox, Traci B. “Multiple Pregnancies: Determining Chorionicity and Amnionicity.” Thomas Jefferson Univeristy Department of Radiologic Sciences Faculty Papers. http://jdc.jefferson.edu/cgi/viewcontent.cgi?article=1000&context=rsfp. Morgan, Matt A. and Radswiki et. al. “Dichorionic Diamniotic Twin Pregnancy.” Radiopaedia.org. http://radiopaedia.org/articles/dichorionic-diamniotic-twin-pregnancy. Al Riyami, Nihal, Al-Rusheidi, Asamaa, Al-Khabori, Murtadha. “Perinatal Outcome of Monochorionic in Comparison to Dichorionic Twin Pregnancies.” Oman Medical Journal. , May 28, 2013, pg. 173.